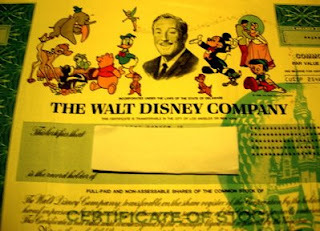 This is a stock certificate for The Walt Disney Company. Notice the characters on it- Mickey Mouse, Winnie the Pooh, Cinderella, Chip and Dale, Tinkerbell, and, of course, Walt Disney. You can also see the Cinderella Castle, and Spaceship Earth from EPCOT. By owning Disney stock, not only do you get to own a piece of a great company, you can even get this nice, pretty piece of artwork to prove your ownership!